My serial casting pots got taken off yesterday which I was very happy about, and my new day time splints (also called AFOs) have also arrived. I had the pots taken off yesterday morning and then went straight round to the department that deals with the splints to get them fitted. It looks like the serial casting has helped to make my ankles less tight, which is what we wanted. I’m not entirely sure how much difference it has made, but I have an appointment with the physio in a couple of weeks so she’ll be able to give me a better idea. When I first came out of the casts my ankles ached for quite a while afterwards but my mum and I did a bit of stretching and that has passed now, which is really quite nice. 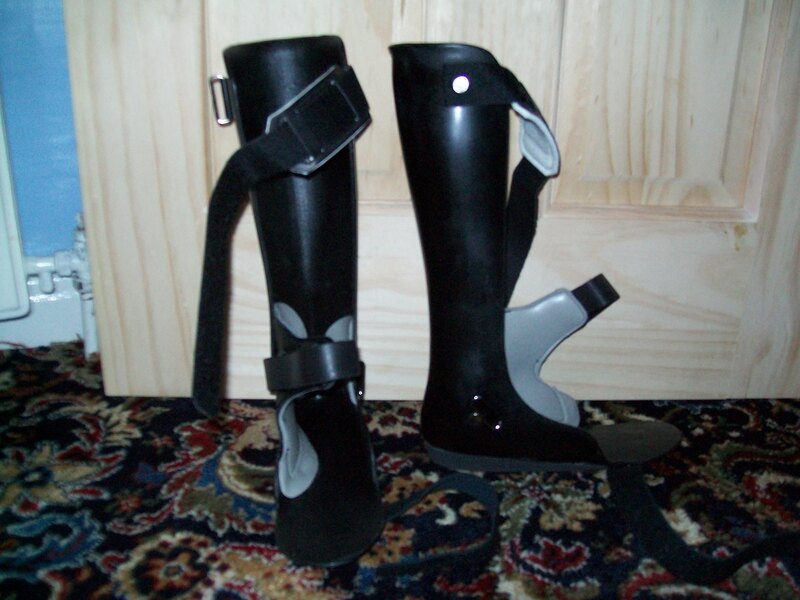 The thing that took me by surprise the most was how strange I found it when I first put my new splints on yesterday. I had them for most of my childhood but stopped wearing them about a year ago when it was decided that we would try to see how well callipers worked for me. Although I’m sure they work well for a lot of people, this wasn’t the case for me because I had a lot of problems with blistering. This is why we made the choice to give splints another go after we had relieved some of the tightness in my ankles by doing the serial casting. I kind of thought that because I’d worn splints for so long before that it wouldn’t really feel odd to me, but it did. Now I just have to go through the process of bedding them in slowly a couple of hours at time until I get used to it again, which could take a while. As I’m only on day two of the process, I’ll update you all about it a bit later on when I’ve got a bit more to say about it. They fit inside a pair shoes that you can buy in the shops too although I have to buy them a size bigger than I would normally take without them and make sure that I get a pair that is wide enough to accommodate them. I guess it’s time that I dug out my old collection of over-the-knee socks that I used to wear with my old ones. I find that helps to make them more comfy because it stops them sticking to the back of my legs. I’ll let you all know how I get on. how you getting on with the bedding in? are you going to customise them?? It’s going okay so far. I’m going o try andlast about 3/4 hours today, but I’m not quite ready to do a whole day yet. Might customise them, not sure yet. Thank you! Yeah I might get some stickers or something. Do you mind me asking, do you put your splints on yourself or do you get someone to help you. I had a go at doing one of them the other day and it took me ages. don’t mind anyone asking anything about cp stuff… I put them on myself, I only need help if I’m have a reeeeeaaallllly bad cp day 🙂 I customise mine with stickers, time for a re design soon I think!! I’m the same, I’d always rather people ask me. I only tried with the right one the other day (my good side) and that took ages, then the orthortist helped me with the left one. I’m thinking it might be easire if I prop my feet up on a stool or something. Ooh what are you thinking for the redesign? not sure yet… going to wait with the right one until after my orthotics apt next week, as I might need a different one as I’m convinced it wasn’t cast properly and it just doesn’t feel right. If I do need a new one I’m going for skull and cross bones transfers!! have got metalic silver stars and ‘born this way’ in my design kit, so could do something with that 🙂 I find it easier to put them on sitting on the bed propping my feet up on a chair or something like that, trying to get them on when I was on the beach on holiday was interesting! I had to admit defeat on that one and get my friend to help! It sounds like it might be better to wait then and see what happens there. Oh man I bet that was hard work on the beach! I hate it when you get sand in your splints, that’s really annoying. that’s what I plan to do, the left one is in desperate need of a redesign, as all the transfers are peeling off. But I the designs have to coordinate, and has to go with the colours I wear most!! I like them to be personal and say something about me – the same reason some people have tattoos I suppose 🙂 oooh sand in the splints is awful!! !